Information and download available at http://apagreekkeys.org. 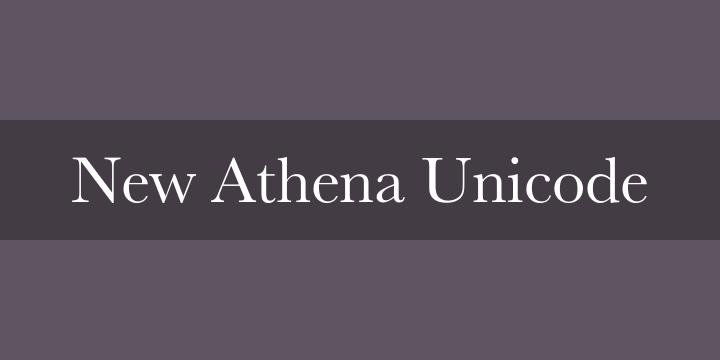 New Athena Unicode is a freeware multilingual font distributed by the American Philological Association. It follows the latest version of the Unicode standard and includes characters for English and Western European languages, polytonic Greek, Coptic, Old Italic, and Demotic Egyptian (and Arabic) transliteration, as well as metrical symbols and other characters used by classical scholars. New Athena Unicode is a “smart font”: it contains OpenType ligature instructions that allow the display of well-formed precomposed glyphs in response to input of two or more Unicode code points. This capability allows the use of combinations like alpha with macron and acute and smooth breathing depending only on official Unicode code points. Ligatures are also used for correct placement of dots (U+0323) under Greek characters or strokes over Coptic characters. The same capability is helpful or necessary for some characters needed for papyrological transliterations of Demotic Egyptian or Arabic. Proper display of such features requires use of modern applications that support them.